Thursday April 11, 2019-Machakos Governor Alfred Mutua wants a generational change in the leadership of the country come 2022. The county boss said his 'Tumechoka Brigade' advocates for new leaders in the next general election. Speaking in Mombasa during a meeting for the Machakos' Kenya Secondary Schools Heads Association, Mutua, who has formed his Team Tumechoka Brigade, said the likes of Raila Odinga, William Ruto and Uhuru Kenyatta must hang the boots come 2022. “I don't mean to say they have not done anything for this country, but we should now pass the leadership baton to the younger generation. 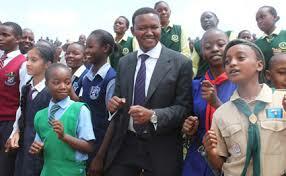 It is time for a generational change in politics,” Mutua said. The Maendeleo Chap Chap party leader said only new faces will make a difference in Kenya's political scene. “The United States, which is the largest economy of this world at USD 19 trillion, with the biggest army in the world in terms of power and ability, with nuclear power, rockets that go to the moon, they gave their leadership to a 47-year-old called Barack Obama. But in Kenya, we have an older generation that still wants to compete with the younger people," he said.